Built on the grounds of the ancient city of Kition, it was once an ancient kingdom and centre of Christianity during early Christian years. 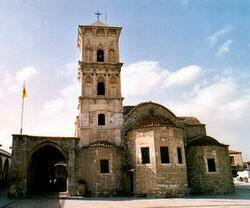 In the 18th century, Larnaca was a trading centre for the island. Larnaca was originally known as Kition or Khittim and legend has it that the first settlement at the spot was founded by Noah's grandson Khittim. The name Larnaca probably comes from the Greek word "Larnax", which means sarcophagus, many of which have been unearthed in this area. After the turkish invasion in 1974, Larnaca Airport has become the Cyprus International Airport. With a population of about 62'000, the toen has managed to retain a relaxed, leisurely atmosphere. 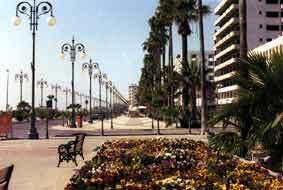 The Larnaca marina with 450 yacht capacity attracts many boats as a safe wintering place. The Church of St. Lazarus standing in the centre of the toen is well worth a visit. The tomb of St. lazarus, who is the patron saint of Larnaca, is under the sanctuary. the church one of the best samples of the Byzantine architecture in Cyprus. The Larnaca district Archaeological Museum at Kalogera Square exhibits an interesting collection of finds from the area, while at the Pierides Museum one will find a provate collection of cypriot antiquities. The Larnaca Fort at the seafront was built in 1625 and was used as a prison in the first years of British rule. It now houses a small archaeological museum and is used as the Larnaca Municipal Cultural Centre. The Main shopping area is Zenon Kitieos Street, a typically busy road of small shops, whilst the palm-lined seafront is offered for relaxiation, as it bustles with cafes, tavernas, shops and bars. 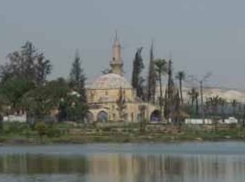 At the Kamares area, 5 km from the airport, is the Hala Sultan Tekkes built in 1816 over the tomb of Umm Haram, who died on this spot in 649 during the first Arab raids. The Tekke is an important place of Moslem pilgrimage.